Google Blogger Template Installation is quite easy, and any newbie or beginner blogger (blogspot) user can install and upload custom template easily without having any kind of coding or technical knowledge. To apply downloaded template to blogger blog, certain steps needs to be followed by users. So in this article, we at Template Wallet are providing a detailed tutorial and guide with different methods on How to Install a Google Blogger Template on Blogspot Blogs with steps to edit and customize the custom template. There are two different ways to change, customize, modify, edit and install custom template to blogger (blogspot) blogs. The very first thing which you as blogger user needs to do is to find your suitable custom theme over the internet, and then you can get .XML File of Template. All blogger themes have one universal file format which is .XML. After getting XML file, then you can start blogger custom theme manual installation and customization. So let's follow our two approaches below to install and upload custom template to blogger (blogspot) blogs. Step # 1: Search Blogger Template: As I said earlier, the very first thing you need to do is to search a blogger template online. You can choose and select blogger themes from TemplateWallet.com. You will find free blogger themes and as well as premium blogger themes. You can download blogger template of your choice from the provided link for free. Step # 2: Upload Blogger Template: Now after you download blogger templates of your choice, you need to extract downloaded file to get .XML extension file format. Unlike WordPress Theme Installation, always remember to upload XML file format on blogger (blogspot). To do this, Login to your Blogger Dashboard >> Go to Theme section (on bottom left side) >> Click on Backup / Restore button (on top right side) >> Click on Choose File button >> Select the .XML Template File (which you have downloaded from step 1) >> Now finally Press on Upload button. That's it, you have successfully installed and uploaded blogger template. You can now live preview your blogspot theme by clicking on View Blog link at top left side. Sometimes some Blogger (Blogspot) users face some weird issues while uploading blogger theme. Some elements or gadgets (widgets) from the old template doesn't get remove or delete from a newly uploaded template. So to solve this issue, you can also apply downloaded template to blogger by following our second working method as mentioned below. It is not mandatory to follow the second method, but if you faced any kind of problem after uploading new blogger theme, then you can follow this second best method. So let's get started. Step # 1: Select Blogger Template: Just like Method # 1, you have to find a blogger template over TemplateWallet.com. After you free download blogger theme, you must extract the file and get XML File of Blogger Template. 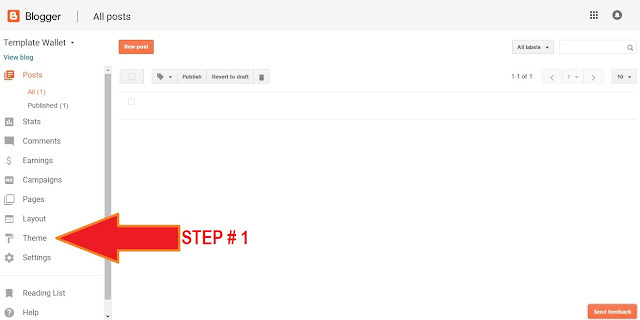 Step # 2: Upload Blogger Theme: After getting XML extension file of blogspot theme. Go to Blogger Dashboard >> Theme section (on left bottom side) >> Click on Edit HTML button (beside Customize button) at the center of webpage >> Press keyboard keys "Ctrl + A" to select and delete all old theme codes from there >> Now go to your downloaded .XML Theme File (which you have downloaded from step 1) >> Right Click on file and Open with Notepad >> Now Press keyboard keys "Ctrl + A" to select and copy all new theme codes >> After copying codes from Notepad, Go to Blogger theme section again (where you deleted old theme codes) >> Press keyboard keys "Ctrl + V" to Paste all copied codes >> Now Click on Save Theme button (in orange color) and after saving, Press Back button. Congratulations!! You're done.